A properly sized industrial pump will operate efficiently for many years and can save a system from unexpected downtime, costs and wasted energy. Incorrectly sized pumps, on the other hand, can fail if they’re too small or accrue unnecessary expense if too big. As such, it’s incredibly important to have a clear understanding of the application for which the pump will be used before making your selection. Once you have determined the application, you can begin searching for the pump that best meets your particular needs. What can a pump curve tell me? 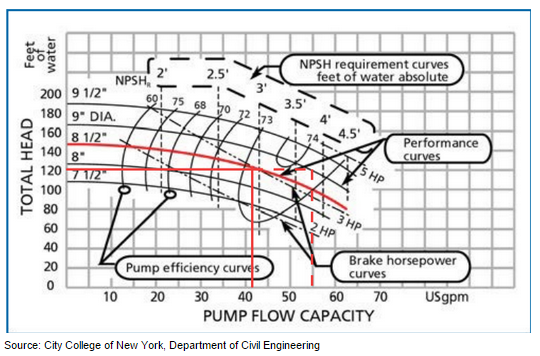 What does a pump curve look like? On a pump curve, you’ll find the pump’s flow rate at the top and bottom, and its height to push on the sides. One of the first things you’ll want to do is select the required flow rate for your application by drawing a vertical line up on the chart. Next, you’ll want to select your desired height by drawing a horizontal line from the left to the right. Once this is done, the pump the best fits your needs should produce a curve just above the point where those two lines meet. By educating our customers about the machinery they rely on for their day-to-day operations, C&B Equipment can help increase uptime while decreasing the need for costly off-site repairs. That’s what we call Uptime Solutioneering™.